This movie review set will mostly be a “She says”. And I didn’t set out to compare these two movies; they just happen to be the last two we’ve seen. 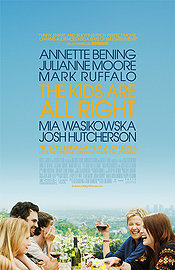 The Kids Are All Right, released July 2010, we saw on rental DVD. (The first DVD I’ve experienced, by the way, that has a special rental version that excludes the “special features”.) It’s about a lesbian couple in a long-term relationship who each have a child with the same sperm donor dad. After the daughter’s 18th birthday, the kids decide they want to meet him. His entry into the family’s life is disruptive, as both children and one of the mothers (Jules, played by Julianne Moore) by turns all find themselves drawn to him, while the other mother (Nic, played by Annette Bening) stays pretty frosty. Donor dad Paul is played by Mark Ruffalo, a good-looking guy whose character is the epitome of cool–he drives a motorcyle, runs a gourmet bistro featuring local organic foods, and owns a wood-paneled house with a terraced backyard. Of course (almost) everyone is smitten! Bit of a spoiler here, but Jules and Paul have a fling that, once discovered, changes the whole dynamic of the movie. Only, I knew most of that going in, and it didn’t really spoil the experience for me. It’s a well-acted movie with a lot of funny bits along with the dramatic undertone. You did end up caring about all the characters. The affair prompted the most discussion between Jean and I: Were Jules and Paul really equally to blame (as the movie suggests), when Jules was the only one in a committed relationship, and the really the one who intiated things? This brings us to Cafe de Flore, released December 2010 and seen at Waterloo’s Princess Theatre. It’s a French-Canadian film that explores some similar territory as Kids, but in a really different way. Cafe de Flore switches between two stories: one in present-day Montreal, involving a 40-year-old, successful DJ (Antoine) who is smitten with his new lover, but his still haunted by ex-wife of 20 years, with whom he had two daughters. Do we hate this guy? No, we do not, as we are given insight into his psyche, through both an omniscient narrator and sessions with psychologist, and because Rose, his new love, is so beautiful and wonderful. But we can’t help but also feel for Carole, the ex-wife, as she is simply unable to move on from the only man she’s ever loved. The other story takes place in Paris in the late 1960s, and tells us of Jacqueline (played by Vanessa Paradis), a hairdresser, and single mom to her only child, Laurent, who has Down’s Syndrome. Defying the conventions of the times, she won’t institutionalize him, and devotes all her energies to making him everything he can possibly be. The parallels and connections between the stories come out slowly and when it’s all out there… The details don’t really matter. This movie is really about the ideas explored on the journey: Do we have soul mates? What is the nature and quality of love? What makes a family? It’s just a gorgeous film, with beautiful shots and fantastic cinematography, and its use of music is exquisite. For characters in both times periods, listening to music is a really important aspect of their lives, and I could really relate to that part of it. Jean also liked this film, though we both thought, not as much as I did. I would say that Kids is a perfectly decent, entertaining, 3-star movie. I think Cafe de Flore could be a 4-star. It’s one I’d definitely watch again. Categories: Movie reviews | Tags: Canadian arts, comedy, drama, family, foreign language, movies | Permalink. would you say cafe de flore is ok for kids to watch? Well, it’s in French with subtitles, so the kids would have to either be fluent in French or be able to read English well. There are also “scenes of nudty and sexuality”, so it depends how you feels about the kids seeing that. It certainly wouldn’t interest younger kids. Preteens–I’m not sure.